Naše první „velká deska“ jako obykle nahraná Blumem ve zkušebně Gattaca a smíchaná a zmasterovaná Willem v Dead Air Studios. Je na ní šest nových songů v délce něco málo přes 20 minut. Vyšlo 500ks na černém vinylu s částečně potištěnou B-stranou a celkem velkým bookletem. // Our first „real LP“ as usually recorded by Blum in Gattaca rehearsal room and mixed and mastered by Will at Dear Air Studios. There are six new songs on the record with total playing time little bit over 20 minutes. 500 copies on black vinyl were made. The B-side is partially screenprinted and there is quite a big booklet. Na téhle kazetě jsou všechny dosavadní nahrávky Remek, který vyšly na vinylu. Jsou tam obě split LP, flexi 7″, demo 7″ a skladba z kompilačního LP Mladá Fronta stárně rychleji. Booklet je ve velikosti A3, jsou na něm všechny texty a obří hlava Vladimíra Remka. // This cassette includes all records that we have released so far on vinyl. 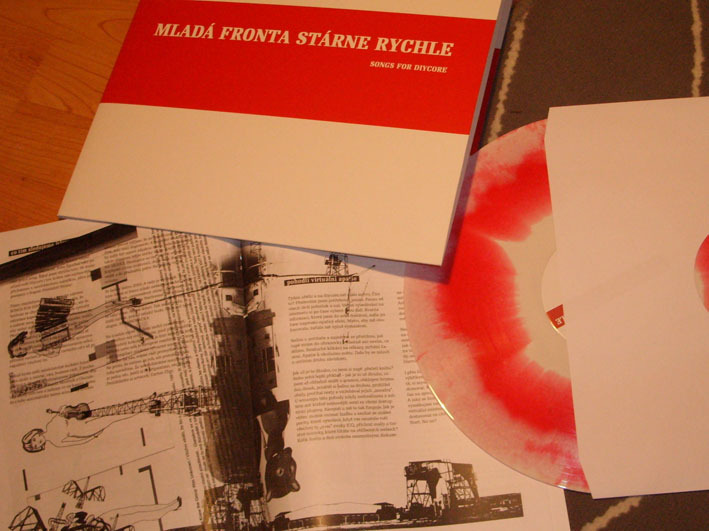 There are both split LPs, flexi 7″, demo 7″ and a song from a compilation LP Mlada fronta starne rychleji. 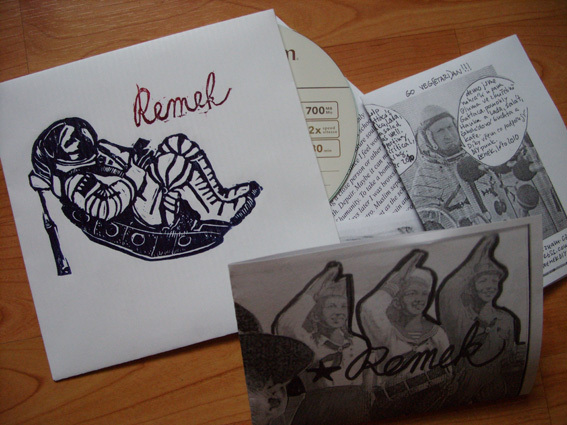 Plus there is an A3 sized booklet with a giant head of Vladimir Remek. Tohle je druhý ze série tří split dvanáctipalců tří kapel – Remek, Child Meadow, Paperplanecrash. Materiál jsme nahrávali v létě 2012 u Bluma. Mix a master obou kapel pak dělal Will Killingsworth v Dead Air Studios. Vyrobeno bylo 525ks na černém vinylu, deska má ručně tisknutý obal na ručně barveném kartonu (díky Paperplanecrash!) 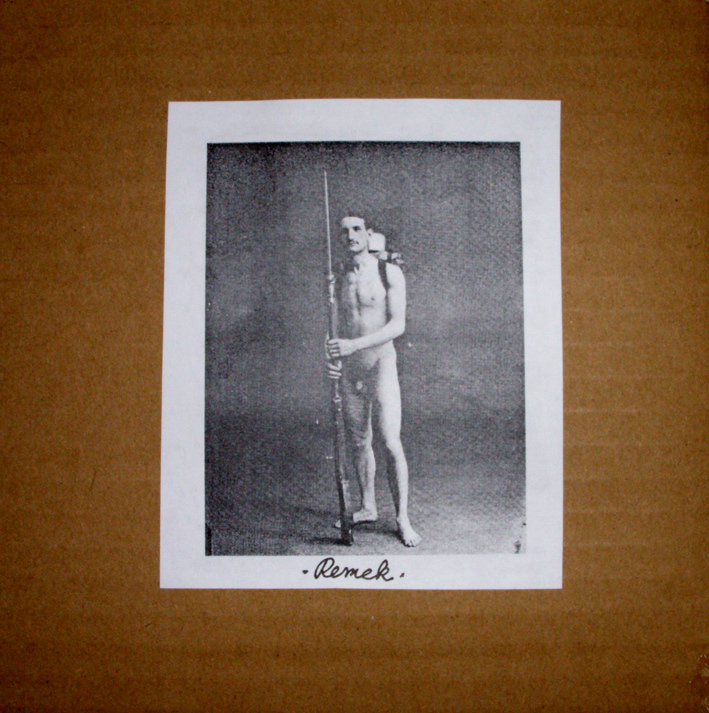 a 16stránkový booklet. Vyšlo v kooperaci Bus Stop Press (fr), Désertion(fr), Dzuskhell (hun), IFB (usa), Junk Cola (mk¨), L’Artiisant (fr), Microsleep (ger), Pure Heart Records (cz), Rope or Guillotine (nl), Slavery & Resistance (sk) and Win Htein (uk). 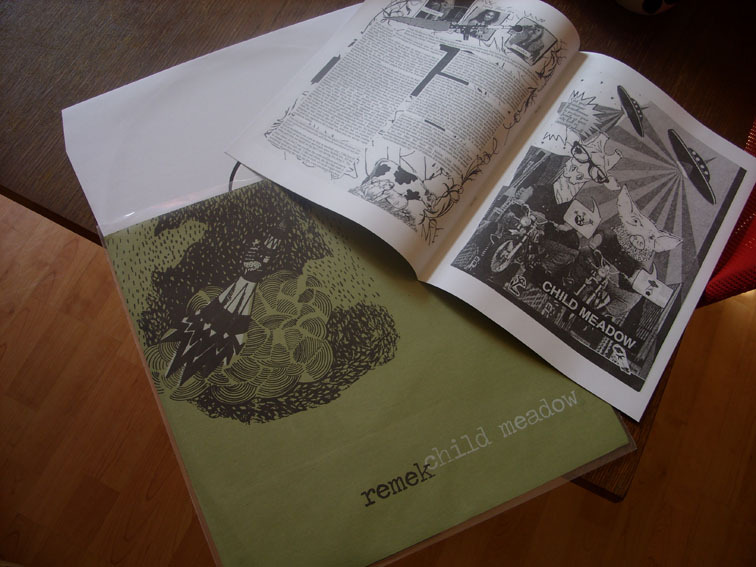 // This is a second part of the series of 3 12″ splits of 3 bands -Remek, Child Meadow and Paperplanecrash. We recorded our material with Blum in Gattaca rehearsal room. Mix and mater of both bandswas done by Will Killingsworth in Dead Air Studios. 525 pieces on black vinyl were made. The record comes with hand colored and hand printed covers (thanks to Paperplanecrash!) and a 16page booklet. Released by Bus Stop Press (fr), Désertion(fr), Dzuskhell (hun), IFB (usa), Junk Cola (mk¨), L’Artiisant (fr), Microsleep (ger), Pure Heart Records (cz), Rope or Guillotine (nl), Slavery & Resistance (sk) and Win Htein (uk). Tohle je první ze série tří split dvanáctipalců tří kapel – Remek, Child Meadow, Paperplanecrash. Materiál jsme nahrávali v dubnu 2011 u Pekla v Kundolabu, kytary se pak přehrávaly v létě 2012 u Bluma, který materiál taky sestříhal. Mix a master obou kapel pak dělal Will Killingsworth v Dead Air Studios. Vyrobeno bylo 525ks na černém vinylu, deska má ručně tisknutý obal na ručně barveném kartonu (díky Paperplanecrash!) a 16stránkový booklet. Vyšlo v kooperaci Pure Heart (cz), Different records (sk), Win Htein (uk), Microsleep (ger), Affinity Index (usa), Bus Stop Press (fr), L’Artiisant (fr), XburanX (cz). 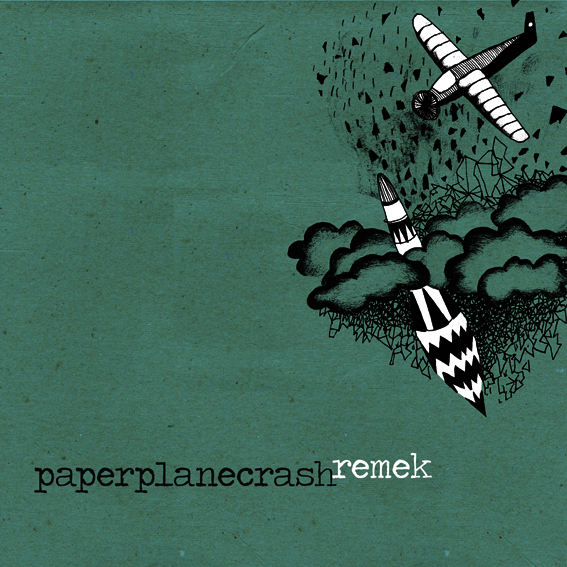 // This is the first part of the series of 3 12″ splits of 3 bands -Remek, Child Meadow and Paperplanecrash. We recorded our material with Peklo in is Kundolab studio and guitars were later recorder by Blum in Gattaca rehearsal room. Mix and mater of both bandswas done by Will Killingsworth in Dead Air Studios. 525 pieces on black vinyl were made. The record comes with hand colored and hand printed covers (thanks to Paperplanecrash!) and a 16page booklet. Released by Pure Heart (cz), Different records (sk), Win Htein (uk), Microsleep (ger), Affinity Index (usa), Bus Stop Press (fr), L’Artiisant (fr), XburanX (cz). Tenhle flexi 7″ jsme si vydali sami s pomocí Revolution Summer records. Nahraný to bylo na konci června 2011 ve zkušebně Gattaca panem Blumem a mix/master udělal taky on. Vyrobenejch je 250ks na průhledné fólii a maj ručně dělanej obal. Stahuj, sdílej a jestli náš chceš podpořit, tak si desku kup. 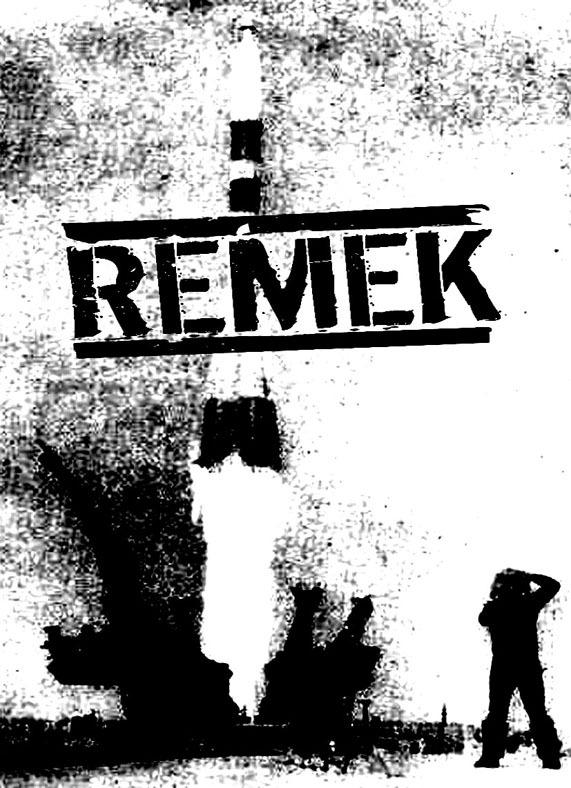 Recenze 1 / Recenze 2/// We released this flexi 7″ ourselves with help of Revolution Summer records. It was recorded/mixed/mastered by mr. Blum in Gattaca rehearsal in July 2011. 250 pieces on clear foil wind handmade covers were made. Download it, share it! If you want to support us, come to one of our shows and buy it. Naši kamarádi v Dog Lovers Records nám nabídli vydání dema na sedmipalci. Protože spoustu věcí viděj stejně, tak jsme souhlasili. Will Killingsworth nám v Dead Air studiu udělal novej mix a tady to je. Celkově vyšlo 125ks, 100 je na prodej. Všechny obaly jsou dělaný ručně a v kopírce. Žádnej počítač. Desky je vyprodaná, ale psi přemýšlí o re-pressu, takže jestli máš zájem, napiš jim sem. Recenze 1 / Recenze 2 / Recenze 3 /// Our friends at Dog Lovers Records offered us releasing the demo as a seveninch vinyl. Because we see many things in the same way we agreed. 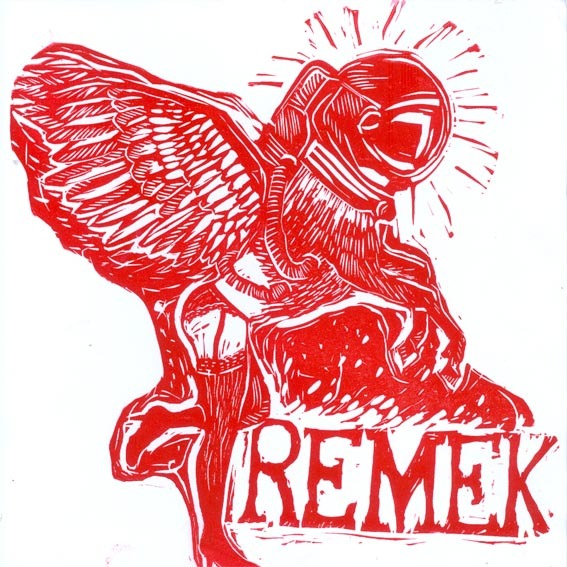 We had a new mix done by Will Killingsworth at Dead Air Studios and here it is. 125 pieces were made. 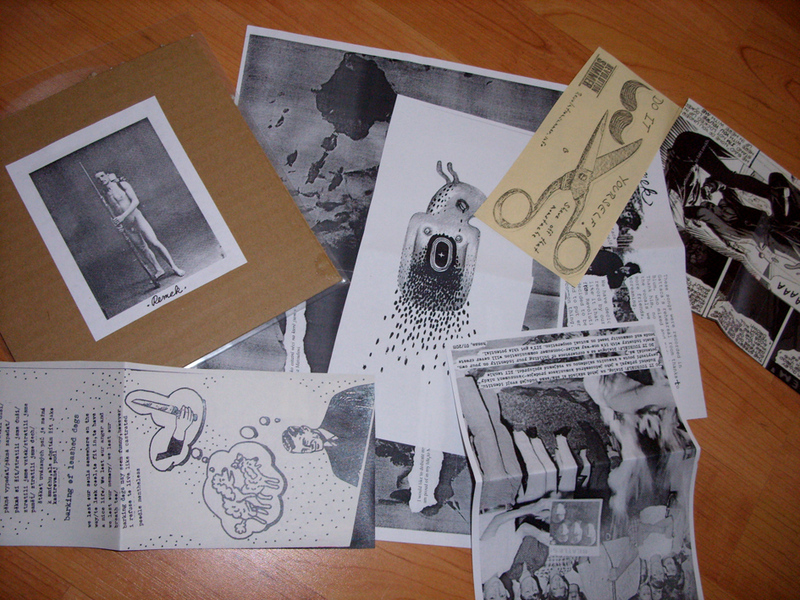 All covers and booklets were handmade or photocopied. No computer. The record is sold out already, but dogs are thinking about re-pressing it so if you are interested, drop them a line here. Soubor ke stažení obsahuje komplet demo včetně scanů obalu a bookletu. Demo nám pomohl za jeden den v červenci 2010 pomohl nahrát Blum ve zkušebně Gattaca. Stahuj to, sdílej to! Pokud nás chceš podpořit, přijď na koncert a kup si demo. 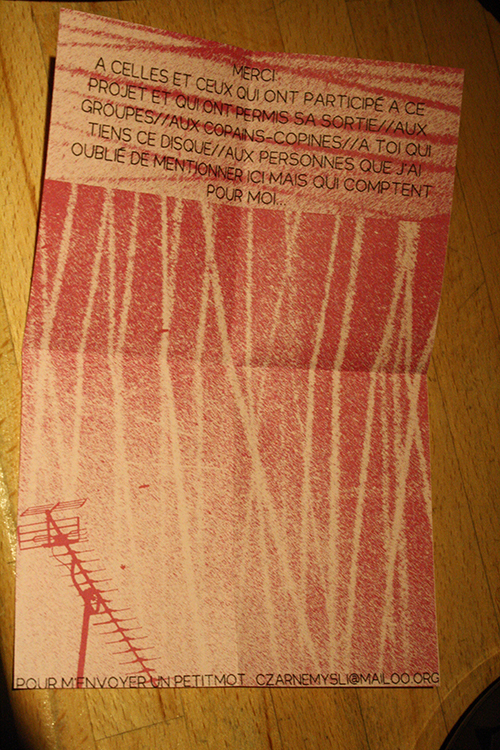 /// The file includes the whole demo together with scans of the cover and the booklet. Blum helped us to record this demo in on day in July 2010 in Gattaca rehearsal room. Download it, share it! Nechali jsme si udělat novej mix dema od Willa K. v DeadAir Studios pro účly vinylové verze, kterou vydají Dog Lovers Records. 5 songů se na sedmipalec nevejde, jeden nám zbejval, tak jsme se rozhodli podpořit zajímavej projekt od DIYCORE.NET. Skvělej nápad. /// We had the demo re-mixed by Will K. in DeadAir Studio for the purpose of its vinyl version released by Dog Lovers Records. 5 songs won’t fit to a seveninch, one remained, so we decided to take part on this interesting project around DIYCORE.NET. Great idea. Vinylová kompilace všech kapel, které přispěly svou písní do projektu Songs for DIYCORE. Vyšlo 273 ks na červenobílém žíhaném vinylu v gatefold obalu a se zinovým bookletem. Seženeš přes info@diycore.net. /// Vinyl compilation of all bands that participated on the Songs for DIYCORE project. 273 pieces were released on red/white vinyl with gatefold cover and zine booklet. Kromě zmíněných nahrávek jsou naše písničky i na několika dalších kompilacích, které mají vetšinou pomoci nějakým lokálním kauzám, a to jak finančně, tak informačně. // Besides what was mentioned above there are few more compilations including our songs. Usually they are release to support some interesting local project both financially and in terms of awareness raising.